Arts and crafts with your grandchildren is one of the most rewarding things about being a grandparent. You’ll create mementos together that you can keep and cherish forever. If you’re looking for some creative arts and crafts that you can do with your grandchildren, check out these ideas. Try going for a nature walk with your grandchildren and have them collect some pieces of nature along the way. This could be little sticks, leaves, grass, flowers, shells, or any little thing that would fit on a bracelet. You will need glue, felt, and a pair of scissors for this activity. Gather together all the little pieces of nature you collected. Using the glue and a strip of the felt have your grandchildren glue their favorite nature trinkets onto the felt. Let it dry so the glue sets. Then cut it to fit their wrists. Now you’ve got a nature bracelet that your grandchildren will proudly parade around all day. For a memento that you can keep forever mugs make a great choice. You could have your grandchildren paint a picture on a piece of paper and then upload that picture to Minespress.com and have it printed onto a mug. Nothing is more exciting than receiving a mug with a picture on it that they created themselves. Of course there are alternatives ways to create mugs. But I can’t think of one that gives you pleasure twice: once when you make and upload the picture, and again when it arrives on a mug. Use the mug or just proudly display it for everyone to see. Now this activity might get a little messy, but marble art is a very fun way to create some interesting art that your grandchildren will love. There you have it. 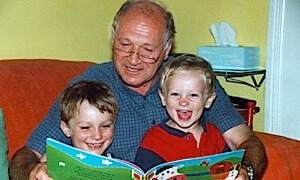 Three great ways to spend time with your grandchildren, make memories, and have a blast doing it! love the marbles in paint. what lovely, abstract pictures. I can see doing this in a shoe box, for instance. The marble art sounds fun. My practical nature is picturing the mess though. The nature bracelet idea reminds me of an essay by Richard Rodriguez title "Children in the Woods." There is nothing like a walk in the woods to set fire to a child's curiosity.